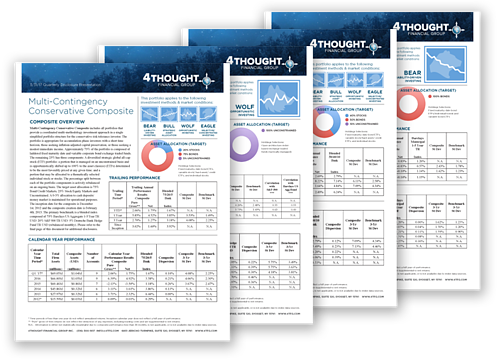 4Thought Financial Group’s separate account strategies are managed with repeatable algorithmic processes so they can be consistently competitive. See how the actual client accounts in each strategy have performed. If you believe one or more of our strategies may be appropriate for you (or your clients), the next step would be to review your situation with us so we can properly help you. It only takes a few moments to get started. Click here to begin or contact us here. Remember, a human being is standing by to help you from 9:00am to 5:00pm EST. If you need any assistance please call 1 (516) 300-1617. Investment advisory services and Separately Managed Accounts offered through 4Thought Financial Group Inc., an SEC Registered Investment Adviser. * 4Thought Financial Group Inc. claims compliance with the Global Investment Performance Standards (GIPS®). The verification report is available upon request. For a list of composite descriptions or to obtain a fully compliant GIPS Performance Disclosure Presentation please email 4Thought at info@4tfg.com.The GIPS firm definition excludes any third party asset management programs over which 4Thought maintains oversight advisory agreements on behalf of its clients and any arrangements under which 4Thought provides recommendations for client self-implementation. Policies for valuing portfolios, calculating performance, and preparing compliant presentations are available upon request. Past performance is no guarantee of future results. The value of an investment may fall as well as rise. Investor principal is not guaranteed, and investors may not receive the full amount of their principal upon making withdrawals from their account if asset values have fallen. Investments in Separately Managed Accounts are not FDIC-insured, nor are they deposits of or guaranteed by a bank or any other entity, so they may lose value. Investors should carefully consider the investment objectives, risks, charges and expenses. This and other important information is contained in the composite description and 4Thought's Form ADV Part 2, which can be obtained from 4tfg.com or by calling (516) 300-1617, and should be read carefully before investing. The strategy(ies) referenced use investment techniques with risks that are different and in addition to the risks ordinarily associated with equity investments. Such techniques include active management risks, non-diversified concentration risks, unconstrained asset allocation risks, high portfolio turnover risks, exchange traded fund risks, debt securities risks, currency risks, and foreign investment risks, which may increase volatility and may increase costs and lower performance.